Father Jeff Hebert lights the first candle on an Advent wreath to mark the beginning of the liturgical year. Advent is season that includes the four Sundays leading up to the celebration of Christmas. Advent wreaths are typically made of evergreen branches into which four candles are placed. Three are purple and one is rose-colored. The purple candles symbolize the prayer, penance, and preparatory sacrifices and good works undertaken during this time. 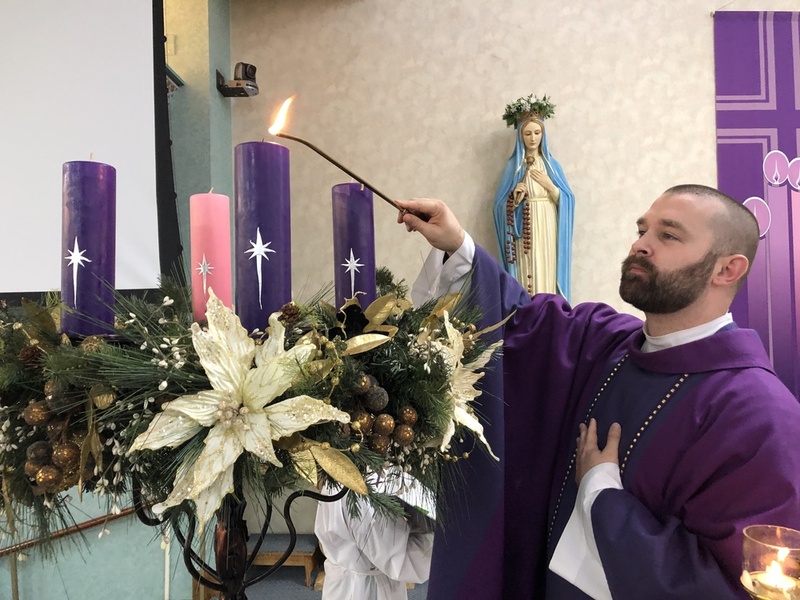 The rose candle is lit on the third Sunday,known as Gaudete Sunday, which denotes a time or rejoicing when parishioners' preparations are half-over and closer to Christmas. The progressive lighting of the candles symbolizes the expectation and hope surrounding the first coming of Jesus Christ into the world and the anticipation of His second.